It’s been a long few months with the last several weeks of interminable delays in getting out of our home in NJ. with septic problems and a buyer who wouldn’t close until it was operational. In any event, with that project finally completed (can you say “congratulations on your shiny new septic”), we finally moved last Thursday and are now in our new home here in Essex CT. In spite of being here we are anything but settled with many boxes still left to unpack. I would have liked to have posted in sooner but there hasn’t been anything to talk about besides wishing that I was doing something on Pandora to get her ready to launch in late May. However, this Wednesday I expect to head down to Norwalk to spend several days getting her ready for the season. There remains much to complete including the wiring connections on the watermaker, installing the wi-fi and working on the cockpit enclosure. Yikes, the list remains long. In spite of it all, I was able to spend a bit of time out on the CT river in Essex last week when our son Christopher visited from NYC for the weekend. He and I took the guide boat that I spoke of in my last post out for a run on the river. It was pretty breezy but warm and sunny and we had a great time. 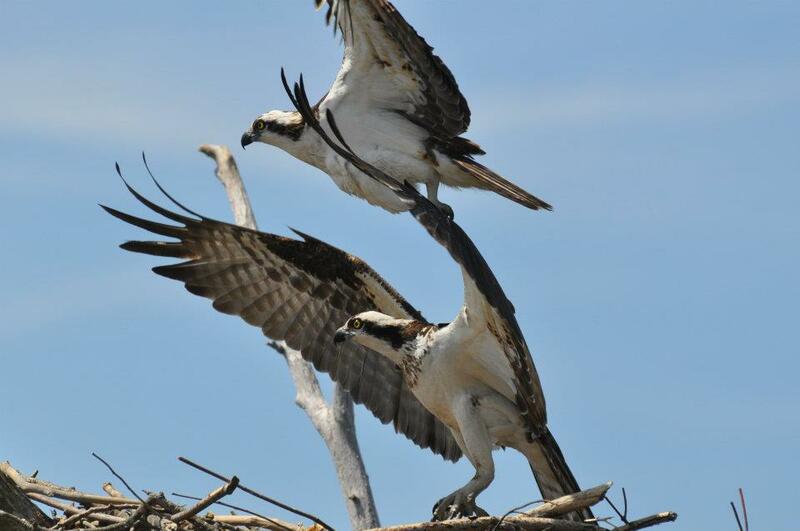 Along the way he took these photos of a pair of osprey’s landing on their nest. As there were chicks/eggs in the nest, they were aggressively protecting the nest from our intrusion. Great shots. He’s a gifted photographer and has the patience to get the right shot. Not sure which this is, male or female. Just take a look at those pointy talons. I’d hate to be on the receiving end when they are out fishing. 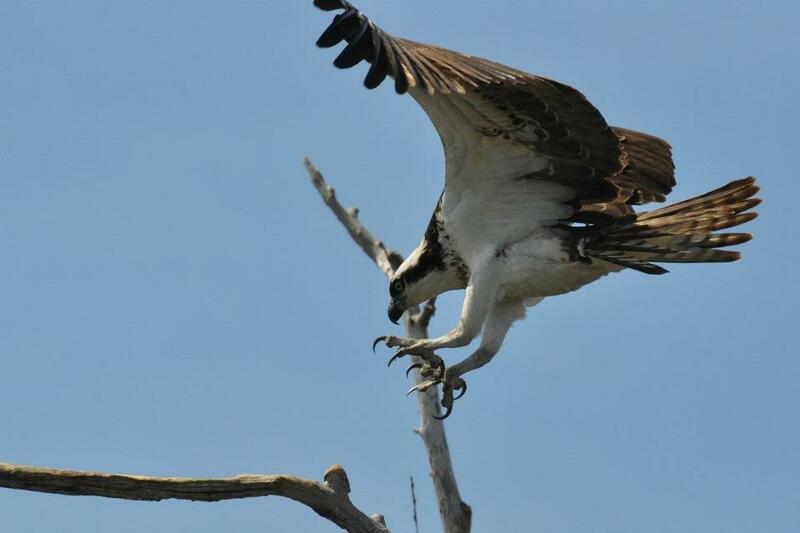 I also think that it’s a good thing that ospreys don’t have 20′ wingspans or sailing would be a bit less fun. “Hey, there’s a nice juicy human that we can feed our chicks. No, be my guest, you go first. Here Bobby, Bobby!! Hmm, that was a bit random… Never mind. I guess that will have to suffice for now as I am up to my elbows in boxes and unpacking. I can’t wait for things to settle down so I can get back to serious stuff like sailing. Prior to sailing big boats (larger just actually, not BIG like the .001% boys), Brenda and I traveled for vacation to Lake Clear in the Adirondacks as I had with my parents for many years. 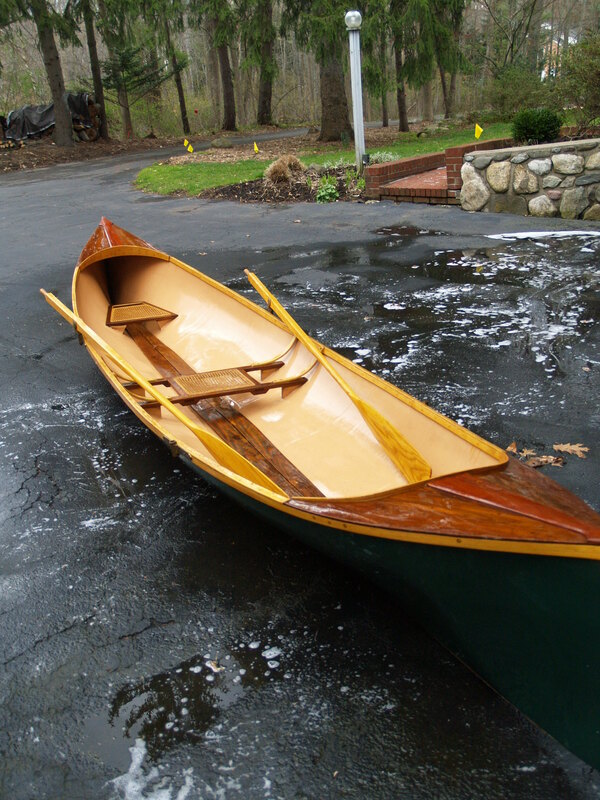 During the many summers at Lake Clear, near Saranac, I fell in love with the sweet lines of the classic Adirondack Guide Boat, a style of pulling boat designed for hunting guides to take their customers (sports) out on the lakes in the area to hunt and fish. 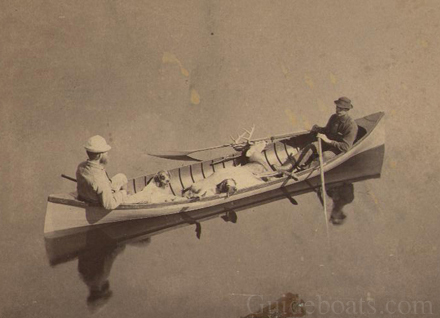 Due to the fact that the many lakes were close to one another and yet required frequent portages or “carries” where the guide would have to carry the boat from one lake some distance over land to the next launch area, these boats had to be very light so that they were manageable and easy to handle. 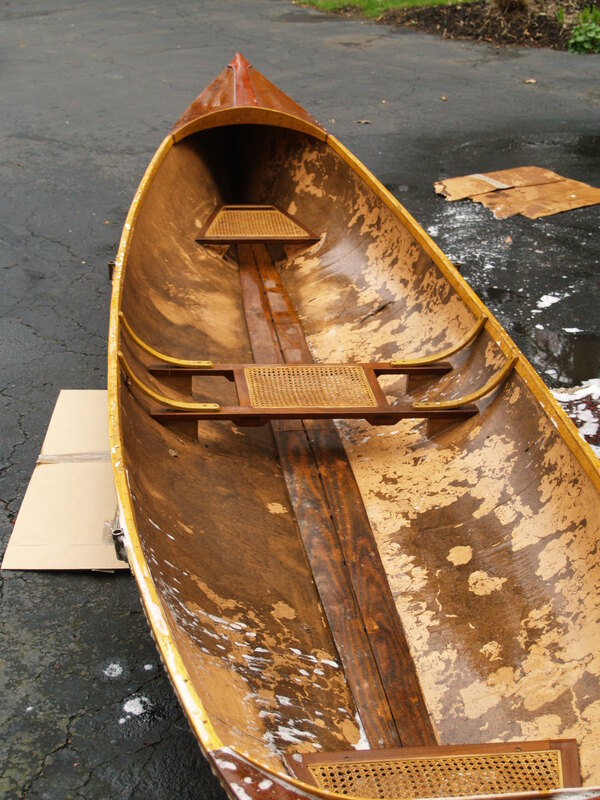 While traditionally built out of wood, many of the modern day versions of these boats are built in kevlar, again to ensure that they are as light as possible. 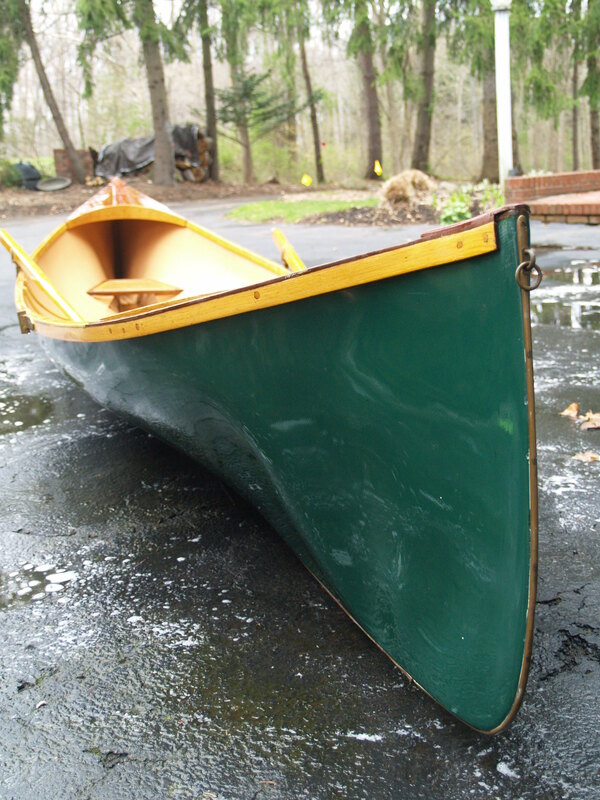 Years ago, nearly 30 actually, I purchased a bare kevlar hull of a 16′ guide boat and finished it myself. 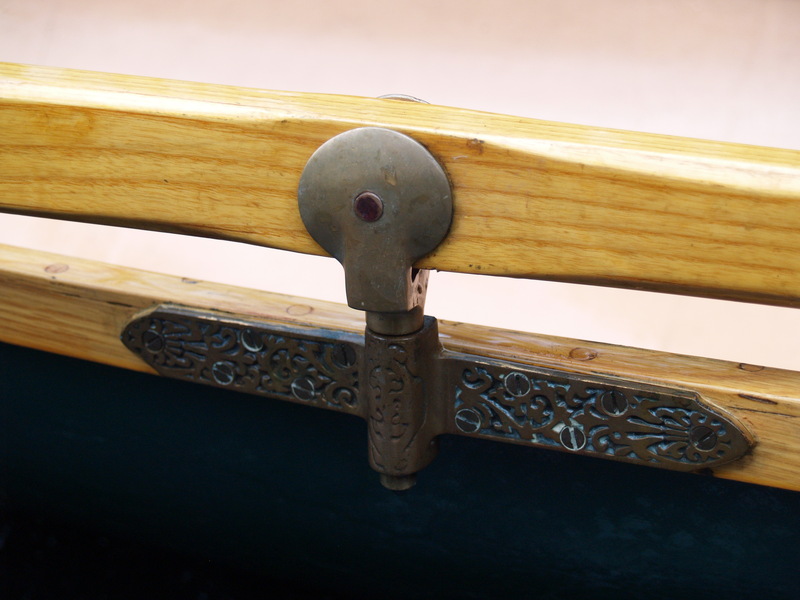 The decks, fore and aft, and side rails are made of a combination of cherry, ash and walnut and the seats are caned. I even got ash blanks and made my own 8′ oars or sweeps, to match the design. 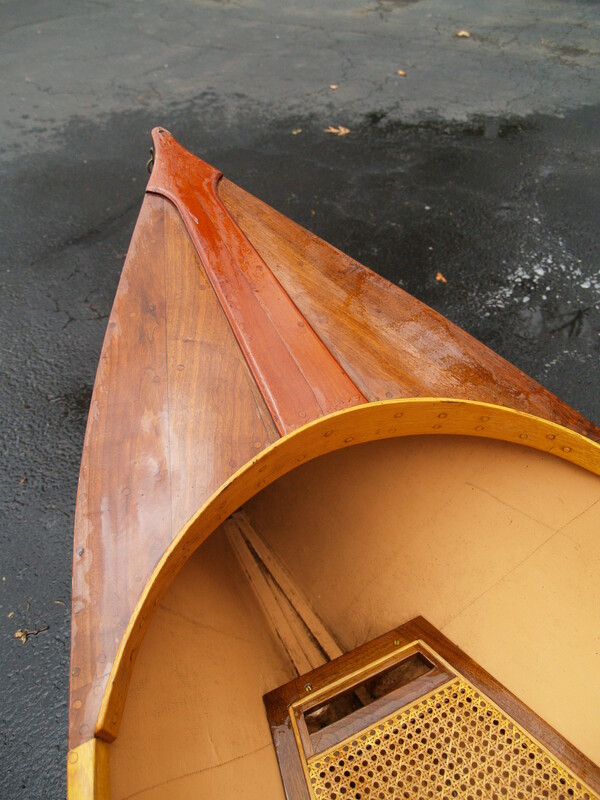 The hull shape was taken from a wonderful boat Ghost built by a well known boat builder, Durant back in the 1800s and now in the collection of the Adirondack Museum in Tupper Lake which can be found, who would have ever guessed, in the Adirondacks. 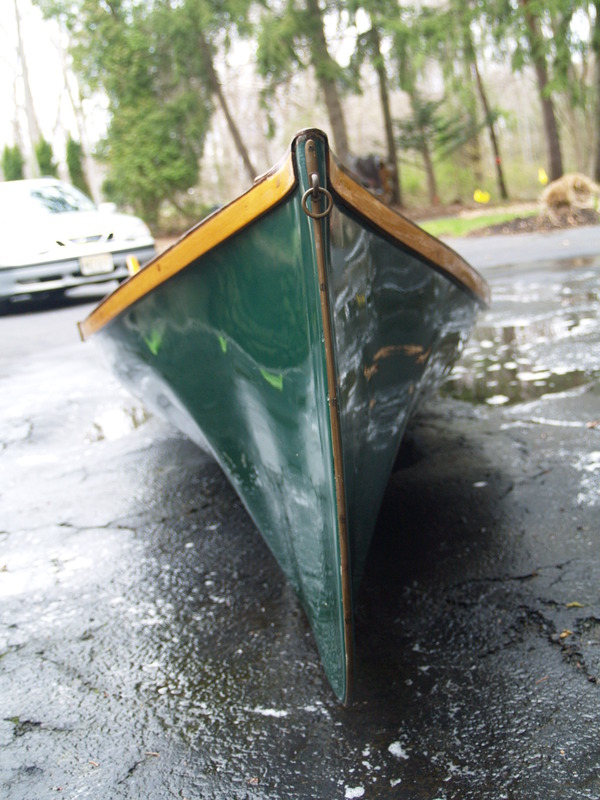 Once we got into cruising Long Island Sound, the guide boat went into storage hung up high in my parent’s garage and for the last few years jammed under our front porch. 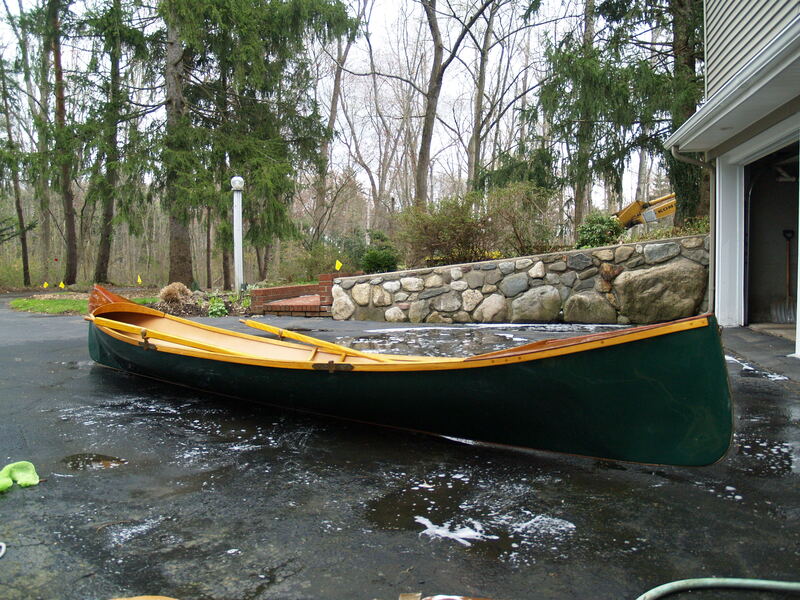 As our new home is just one mile from the Connecticut River, we will once again be able to use our guide boat and for the first time since our boys were toddlers. Now our boys are 26 and 28 years old so it’s been a lot of years since the boat has touched water. As you can imagine, after so many years in storage, the guide boat was pretty nasty looking as is witnessed by this shot. The under porch storage was very tight and while protected from much of the weather, it was a pretty humid place. Fortunately, the wood chucks that live under the porch hadn’t “chucked wood” or damaged the boat in any way. I did find some leaves tucked up under one of the decks that looked like a comfortable nest, perhaps for some mice. Pretty nasty but there is beauty in there somewhere. After a bit of scrubbing, beauty… Actually, a lot of elbow grease on this baby. As I mentioned, walnut and cherry decks. Oh, if it wasn’t clear, this wasn’t a kit, just a bare hull and a pile of locally purchased lumber. Not bad for a beginner. I must have been in my late 20s when I finished her. Amazingly, the varnish hasn’t been touched in all the subsequent years. Nice when you can keep a boat out of the weather. No, I didn’t weave the cane seats. They are machine woven. CHEATER, CHEATER!!! Yes, don’t be too tough on me, we all make compromises. I was even able to fine hardware true to the original design of Ghost. It’s great to have nice hardware on a great boat. GOD is in the details as is the case in all of life. What amazing lines this boat has. She really moves through the water. One thing that this boat has in common with our SAGA 43 Pandora, is a fine entry. They both move through the water very easily. Straight on you can really see how this boat would track on the water. Like a knife… Fine, really fine… No, I won’t be distracted from Pandora this summer but what better way to kill a few hours on the CT River than aboard a classic guide boat. There’s even a caned seat back (alas, packed for the move and not shown) for Brenda to lounge against, parasol in hand as we head out on the river. Perhaps we will want to avoid the whole “dead deer in the bottom of the boat thing” as is in the case here. No, and I am confident that Brenda will be good deal more attractive and a lot less smelly than the guy who is a passenger in this classic photo from Guide Boats.com. There’s a lot of great information here on the history of this unique North American craft. In about a week we will be moving out of our NJ home and will be able to begin enjoying this great boat again after what seems like a lifetime ago. So much to look forward to.